MCA 5926. 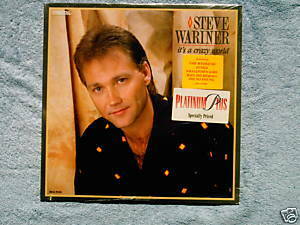 Steve Wariner It's A Crazy World 1987 LP includes The Weekend, Lynda, Smalltown Girl, Why Do Heroes Die So Young, If I Could Make a Livin' (Out of Loving You) with Vince Gill; produced by Tony Brown. Sealed LP with thin sawcut on lower left corner and some cornerwear.